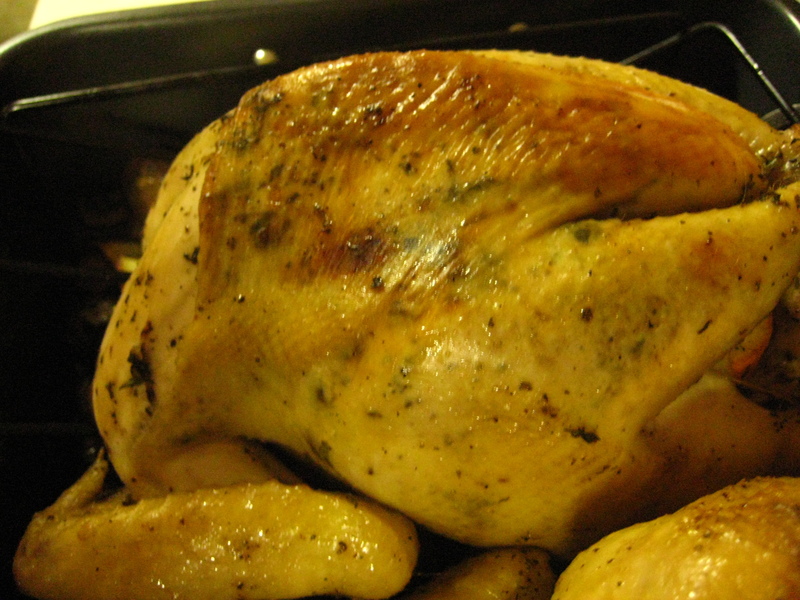 To supplement my family’s Thanksgiving turkey, I made the classic foodie favorite: roast chicken. Nothing flavors chicken like thyme and hard work. This recipe is near and dear to our hearts because it was the first dish that started the Foodie Friday tradition. John and Katherine were talking one day, and John suggested that he roast a chicken for dinner for a few friends. Katherine agreed and invited Yang Yang, and John called Mark and Paul. The rest is history. The key to moist meat is to basting; make sure you baste every 20-25 minutes until the chicken is cooked through. My favorite part of the dish is the vegetables. You can also include potatoes in the same pan. There’s no need to use olive oil or butter, just season with salt, pepper, and herbs and let the chicken drippings do their magic. I use a roasting pan with a rack at home, which makes room for a lot more tasty vegetables. If you’re looking for a simple way to venture into the roasting world, this recipe is an excellent choice. Happy roasting!